Virginians seem to have had their fill of fancy, high-priced wine these days. If the newly established Loudon County (LoCo) Ale Trail is any indication, beer is having a major moment. 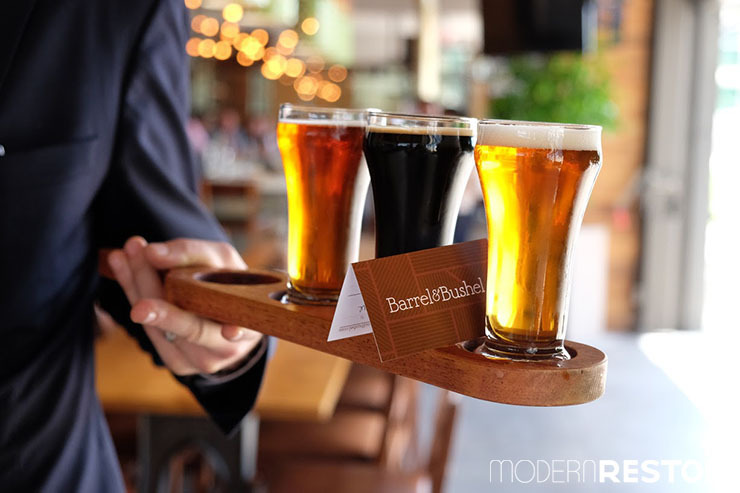 Nowhere is this love of hops more apparent than at the brand new Barrel & Bushel restaurant in the Hyatt Regency in Tysons Corner. 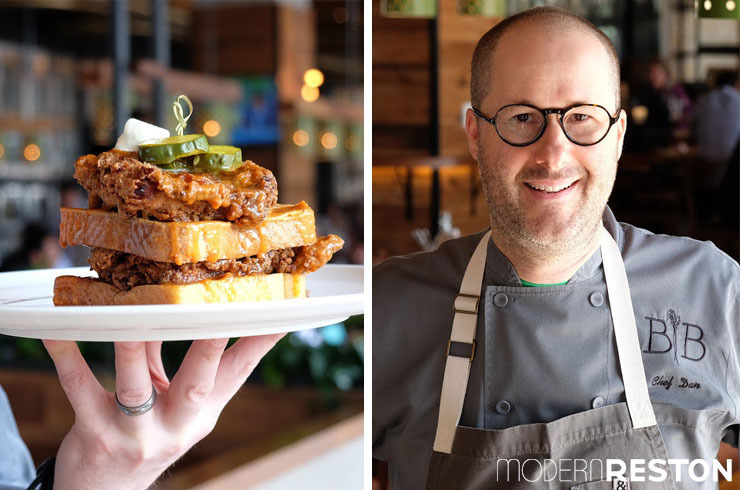 Chef Dan Dienemann (Founding Farmers, Tupelo Honey Cafe, Michael Mina) puts his heart and soul into creating hearty and regionally-inspired dishes that pair harmoniously with the best brews the area has to offer. 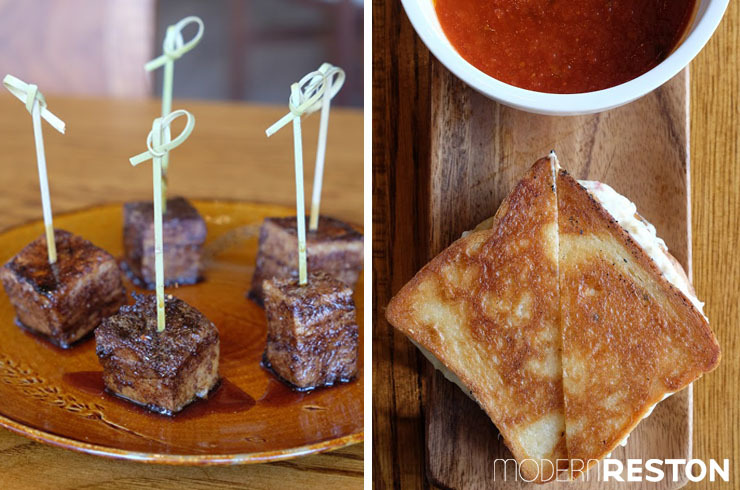 We had the pleasure of sitting down with Chef Dan for a tasting menu that left our bellies full and spirits high. 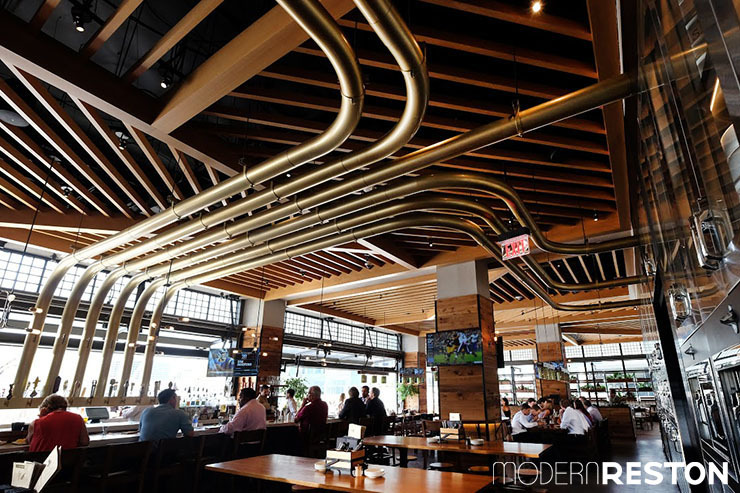 As we entered Barrel & Bushel, we were struck by the sculpturally beautiful system of pipes that run from refrigerated kegs along one wall to the taps behind the bar. And just like that, we forgot we were in the lobby of a Hyatt! 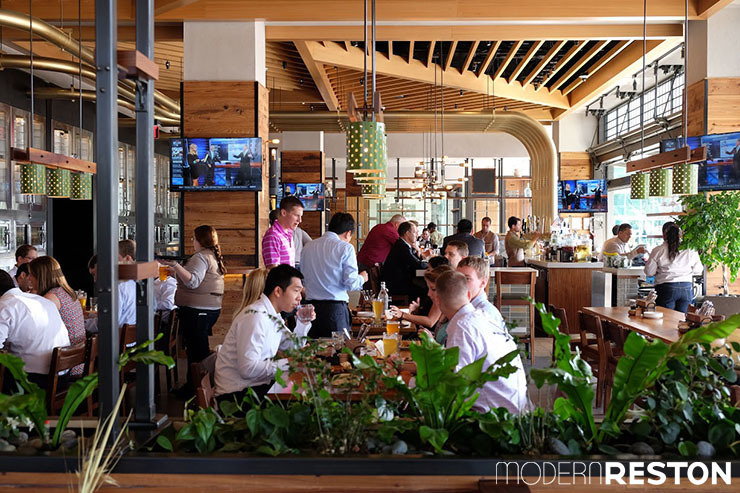 The restaurant is an airy, light-filled space that opens to the plaza. The outdoor patio and bar are perfect for happy hour after work or for enjoying weekly concerts. There is also a section with communal tables for socializing and a dining room for more intimate meals. Chef Dan (who graciously came in on his day off to meet us) explained that everyone at the restaurant is passionate about sourcing ingredients that are handmade, local and responsibly grown/raised. They have also cultivated relationships with individual brewers and have taken great care to pair the right beer with the right dish. As the dishes came out, it occurred to me that Chef Dan is offering more than just the “Standard American Fare.” It’s more like “The Thinking Man’s Standard American Fare.” Dishes are carefully considered and employ many different techniques but steer clear of being overly fussy or precious. While complex, they are large, filling and down-home. And, man oh man, are they delicious. The 72 Hour Pork belly takes three days to rub, cure, render, braise, crisp and glaze. The Grilled Cheese is made with aged Cooper American cheese and a pimento cheese sauce. It’s grilled with mayo for even browning. The roasted tomato soup is vegetarian. 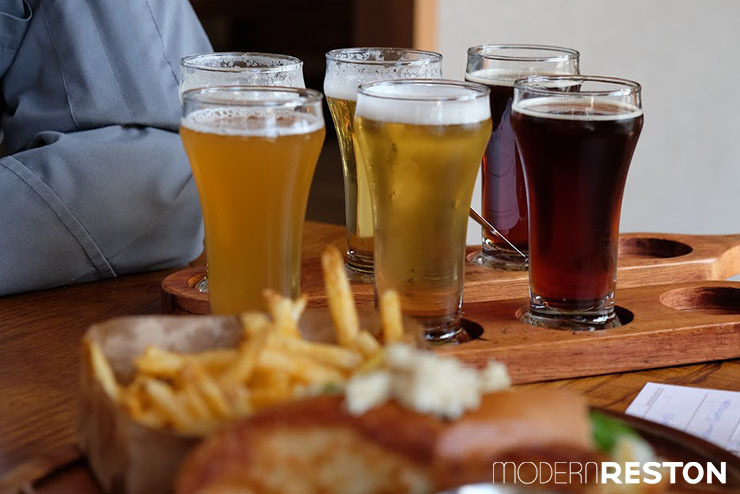 I am pretty pedestrian with my beer drinking and have never considered how it can enhance the enjoyment of food (and visa versa) like wine can. This entire tasting menu was an eye-opener. The sweet maple syrup of the pork belly was heavenly with the malty 3 Stars Pandemic Porter it was paired with. The rich creaminess of the Mayo Grilled Cheese was cut by the crisp Devils Backbone Vienna Lager. Barrel & Bushel even pairs their salads with beer! A refreshing Lost Rhino Hefeweizen was a light and perfect companion for Chef Dan’s Grilled Romaine Salad with fresh avocado, house-made farmers cheese and roasted tomatillo. Grilled corn with pimento cheese sauce (right), vegetarian but by no means diet-friendly! 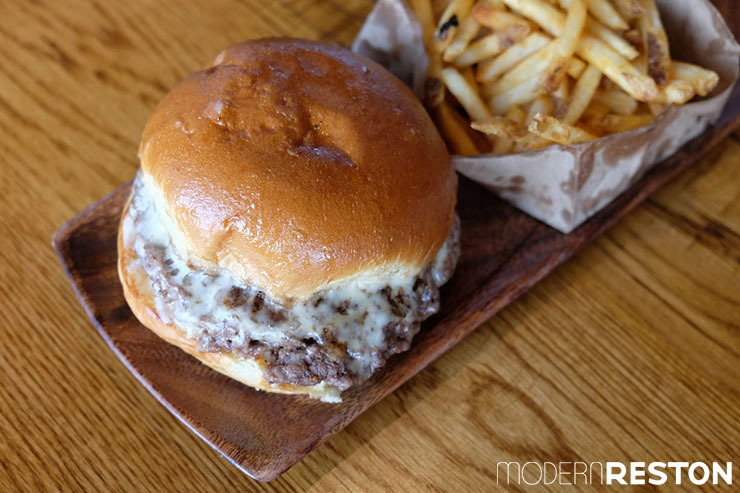 A house-favorite at B&B is the Grass-Fed Pub Burger that is served on a brioche bun with stout and onion marmalade and aged Cooper American cheese. It’s meaty, juicy and flavorful. One of the best I have tasted, period. This big burger was paired with the big and smooth Apocalypse Ale “Wee Heavy” Scottish-style beer. I was pretty much done-for by this point. Chef Dan stepped away for a minute and I fought the urge to unbutton my pants and lay down. I took two bites. It was all I could manage before boxing it up for later. This masterpiece was paired with 3 Brothers Hoptimization IPA. While I don’t usually go for overtly hoppy beers, it worked really well with this dish. The combination has inspired me to give these aggressively bitter beers a chance now and again. The monolithic Hot Fried Chicken and Chef Dan Dienemann of Barrel & Bushel. A big thank you to Chef Dan for presenting such a fun menu! 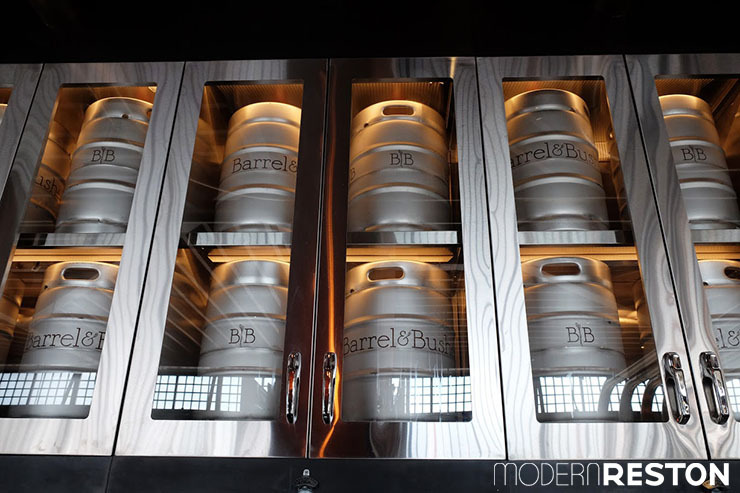 Gather a group of your favorite people and check out Barrel & Bushel. 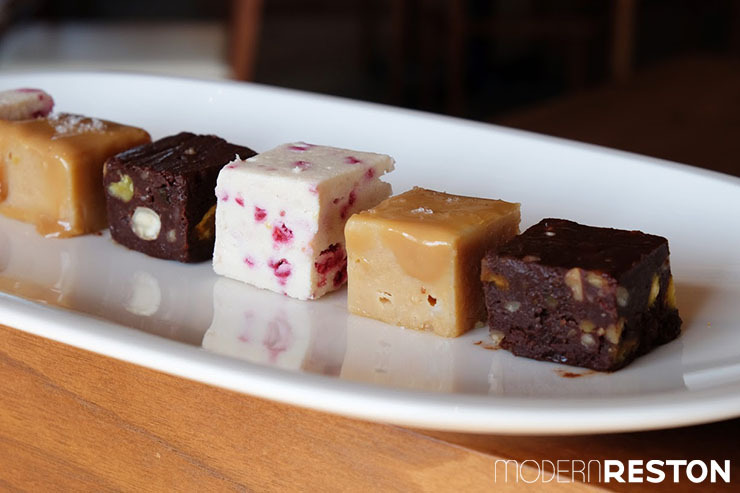 House-made and seasonal fudge: Chocolate Almond, Salted Caramel Peanut Butter, and Strawberry Cream. For a perfect dessert, Chef Dan pairs these with Adroit Theory’s Zero Coffee IPA. B&B also has a wide selection of craft bourbons that we didn’t touch on — just one more reason to come back! Barrel & Bushel is located in the Hyatt Regency in Tysons Corner Center across from Lord & Taylor. 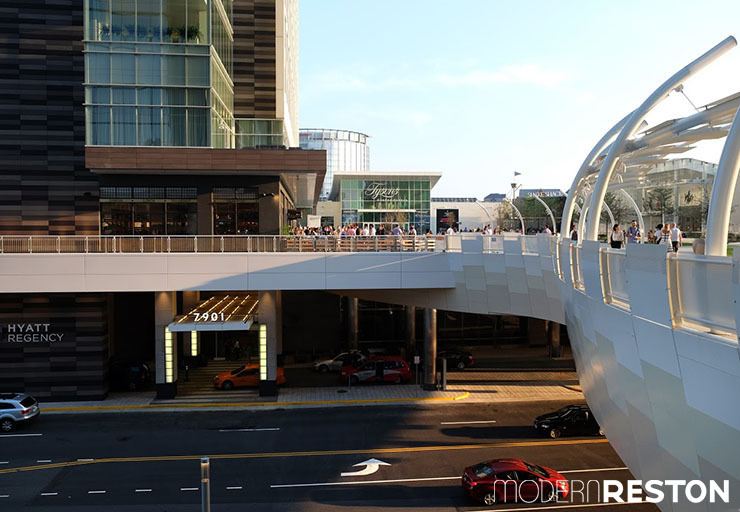 It can be a little confusing to get to but we found that parking on the 4th level of the garage by the hotel provides the easiest access to the plaza. 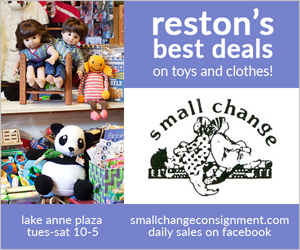 Monday to Friday 6:30 a.m. to 11:00 a.m.
B&B Express 6:00 a.m. to 11:00 a.m.
Saturday & Sunday 7:00 a.m. to 11:00. a.m.
Sunday – Thursday 11:00 a.m. to 10:00 p.m.
Friday & Saturday 11:00 a.m. to 11:00 p.m.
Friday & Saturday 11:00 p.m. to 1:00 a.m.